The expansion of Jaguar Land Rover's Canadian dealer network will not come at the expense of its existing dealers' profitability, said JLR North America CEO Joe Eberhardt, left, who took questions from KC Crain, group publisher of Automotive News. TORONTO -- The expansion of Jaguar Land Rover’s Canadian dealer network will not come at the expense of its existing dealers’ profitability, said JLR North America CEO Joe Eberhardt. 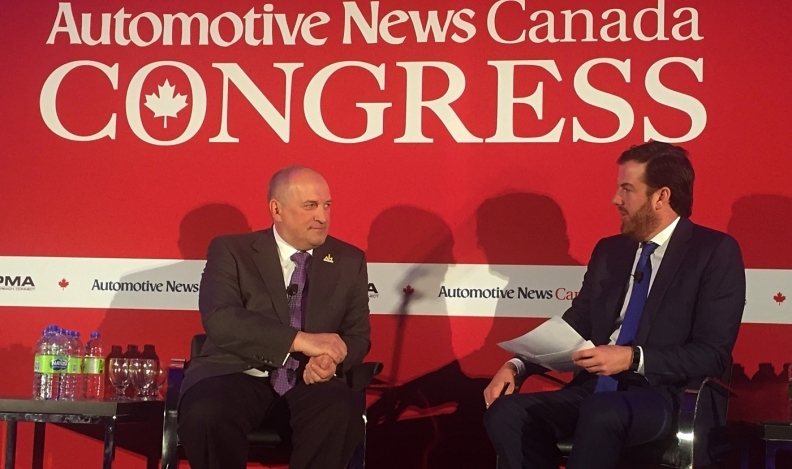 Eberhardt, speaking at the Automotive News Canada Congress, said JLR is in the process of adding seven retailers to its dealer network in Canada, which currently stands at 25 dealerships. He said the new stores are a reflection of the brands’ success in turning themselves around following the depths of the 2008-’09 recession. He expressed confidence that the new dealerships will not bite into the profitability of the existing dealers. The additions to JLR’s dealer network come following a strong 2016 for the British brands. While still the smallest major automaker in terms of Canadian sales, JLR sales gained 21 per cent in 2016, the largest percentage gain of any automaker. The jump was driven in part by a 134 per cent rise in Jaguar sales. Eberhardt said the brands have turned their fortunes around since being bought by India-based Tata Motors because they have invested heavily in building their brand images through new designs, improved performance and by drawing from history. When describing how Jaguar and Land Rover are building their brands, he said successful brands must appeal to a buyer’s eyes, heart and, to put it delicately, hormones. Strong, provocative design can lure buyers to a brand, he said. “It may seem obvious, but a successful brand – especially a luxury car brand – has to appeal to all three senses, if you will,” he said. It also doesn’t hurt that Jaguar and Land Rover are British brands in a pop culture world inundated with British music, television and more.